There he sat starring out our living room window. He sat there for at least thirty minutes. Some of the time he was silent and some of the time he chattered away in his own little language. I wondered what he saw. I wondered what it was that had so captivated his attention. It’s interesting isn't it? It’s interesting how two people (regardless of ability or disability), can look out of the same window, and yet they see such different things. I love to keep my windows open. The first thing I notice when I look out my window is the sky. I love how the heavens declare the glory of the mighty God that I serve with their inaudible praise. Then, I might notice how the sunlight perfectly shines on each drop of dew on the grass. I notice the motion of the wind and I notice how the leaves have been swept across the drive from the night before. I take all this in and it refreshes my soul. 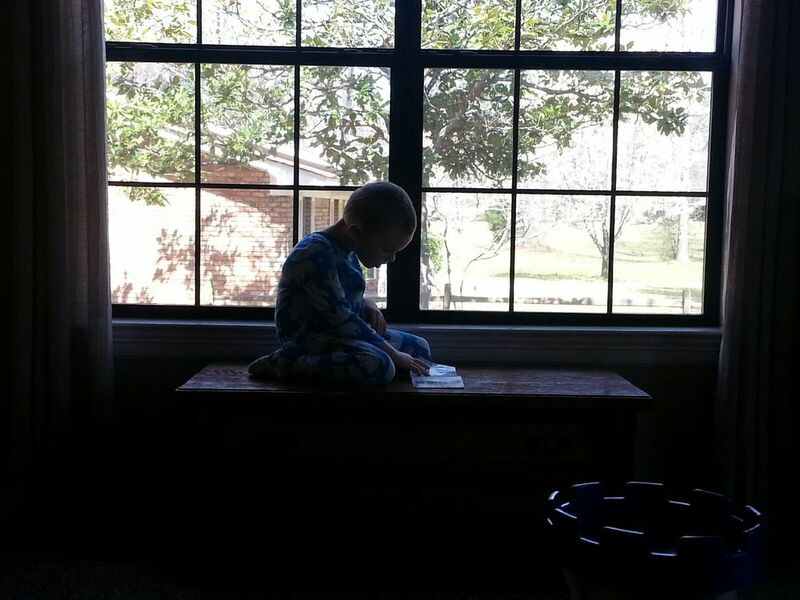 And so I wondered, on this day that my precious son sat beside the window, what is it that he sees? Because he cannot tell me, I speculate…Does he take it all in as one beautiful picture? Or does he look at each tiny detail? Every blade of grass? Every cloud in the sky? Does it bring joy to his soul as it does to mine, to marvel at the beauty of God’s creation each day? Or does it overwhelm him to take in so much? What does he see? In many ways, this is what life is like when you have a child with Autism. You are both looking out the same window, and yet you are both seeing such different things. Ezra and I live in the same world, but the way we experience it is so very different. As much as I want Ezra to see what I see, experience what I experience, feel how I feel, learn the way I learn, and love the way I love, it is not always that easy. What’s even more, who says that there is one “right” way to experience life? I have learned far more, grown far more as a person, and have developed a deeper level of compassion and love by trying my hardest to learn about Ezra’s world instead of demanding he conform to mine. Certainly there is an importance for him to learn from an educational and behavioral standpoint. I am so very thankful for the group of amazing teachers and therapists that have rallied around our sweet boy to help him achieve his very best. But as he learns from us, we must never forget that there is so much for all of us to learn from him. He has a beautiful mind that is constantly at work. What a tragedy it would be for us to take for granted the blessing of a precious child because he does not fit into the cookie cutter of what society deems as “normal” or “acceptable”. I want to become a student of my children. I want to see what they see when they look out the “windows of life”. Grace lives in the same world as you and I. Grace sees the world differently than most six year olds do. Why? Because our family has embarked on a beautiful, but sometimes very hard, life-long journey of Autism. Grace’s experiences as the older sibling of a baby brother with Autism has caused her to think about things, pray about things, and see things differently than many children her age. Sometimes, it’s good to try to “see” what others see when they look out the windows of life. We can all learn so very much from each other. Our faith, our life experiences, our victories, and our defeats all contribute to how we each “see” life. We would be wise to become students of one another. We would be wise to celebrate the beauty of a mind that “sees” differently.